I THINK EVERY WORKING MOM PROBABLY FEELS THE SAME THING: YO - ProudMummy.com the Web's Community for Mums. "I THINK EVERY WORKING MOM PROBABLY FEELS THE SAME THING: YOU GO THROUGH BIG CHUNKS OF TIME WHERE YOU'RE JUST THINKING, "THIS IS IMPOSSIBLE--OH, THIS IS IMPOSSIBLE." 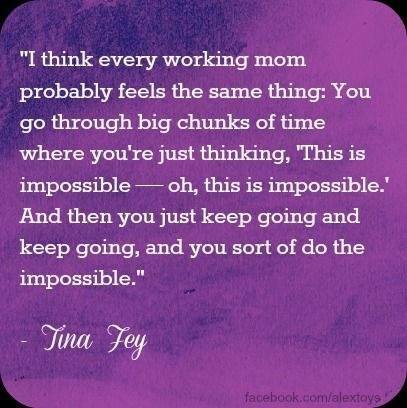 AND THEN YOU JUST KEEP GOING, AND YOU SORT OF DO THE IMPOSSIBLE.